Cunningham-Waters is the southeast’s premier healthcare construction, dental office construction, and medical building construction company, proudly serving SC, NC, and GA. Boasting an energetic, accomplished team and 60 years of successful industry experience, Cunningham-Waters has helped hundreds of medical and dental clients achieve their goals through new construction, repair, renovation, and structural alteration. We work closely with each client, whether it’s a one-person operation or a larger healthcare organization like Greenville Hospital System, and form a partnership from concept to completion. To view a recent project, view our 360° healthcare construction facility tour. 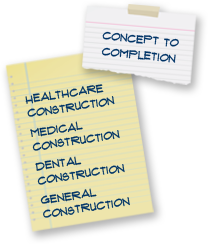 Why Choose Cunningham-Waters for Healthcare Construction? Unmatched client satisfaction – The medical building construction and dental office construction process isn’t easy, particularly for an inexperienced company. Our years of service have led to a 100% satisfaction rating—you can contact any of our medical and dental construction clients and receive a positive reference. Competitive pricing – For three generations, we’ve built quality healthcare facilities, and our efficient process and in-house resources allow us to provide you with a lower cost point than other companies. Design-Build Firm – Because we partner with you from start to finish, we consider ourselves a Design-Build firm. That means when you come to us with a vision for a medical or dental office, we walk you through every step of the process from discussing the demographics and traffic flow for your area to deciding what type of chairs you want in the waiting room. Management of municipal details – We take the headache out of the construction process by handling all of the requirements and permits related to zoning, fire codes, and building inspections. In-house resources – We’re not a “management” firm that uses subcontractors; we have experienced, long-time employees and craftspeople who are skilled in all areas of the building process, including masonry, wiring, flooring, carpentry, steel erection, and concrete work. Not only does this provide for an easier and more efficient construction process, but it means you don’t have to wait for us to call a contractor to fix a squeaky door—we’ll be right there. Exclusive relationship with equipment companies – Our years of experience have enabled us to form key relationships with a variety of medical and dental equipment representatives. We will work with your company of choice to ensure you have the equipment you need to operate effectively and that it is installed properly in your facility. Continuous team improvement - We stay up-to-date with the latest trends, techniques, and materials related to the construction industry and will offer you a variety of options for added architectural flair, such as the use of stone, concrete, wood, and the latest paint color options. Additionally, our work with leaders in the healthcare industry, such as ReGenesis, Blue Ridge Healthcare and others, allows for continued learning of the needs of the healthcare industry. No-fail policy – When you come to us with your vision for your medical or dental facility, we know how important that is to you. It’s just as important to us, and we are fully committed to making your dream a reality. Learn more about us and then contact us for a proposal to find out how we can meet your healthcare construction goals for a quality healthcare facility.